One day dirt. Road the next. The new Quick CX is built to thrive wherever your adventure leads. Cyclists looking for one bike for any adventure, from fire roads and dirt trail explorations to urban commutes and joy rides. BETTER FIT: the all-new Quick CS has a fit much better suited to multi-surface riding and high-performance commuting, with consistent lower stack and longer reach measurements. ALL-CONDITIONS HANDLING: 50mm travel front suspension absorbs washboard and bumps, while our 1-1/2" to 1-1/8" tapered headtube keeps steering precise and confident. 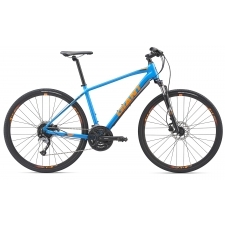 COMFORT AS STANDARD: SAVE Micro-Suspension seat stays and chains stays work with a smaller 27.2mm seatpost, head-up riding position and an ergonomic saddle and grips to increase comfort and control in any terrain. MAXIMUM VERSATILITY: Big 38c multi-surface tyres are fast and grippy on dirt and pavement, and full rack and fender mounts let you customise your Quick CX for the type of riding you're into. LIGHTER = MORE FUN: Thanks for Cannondale's unmatched aluminium expertise, Quick CX is super light but offers heavyweight performance on-road of off. 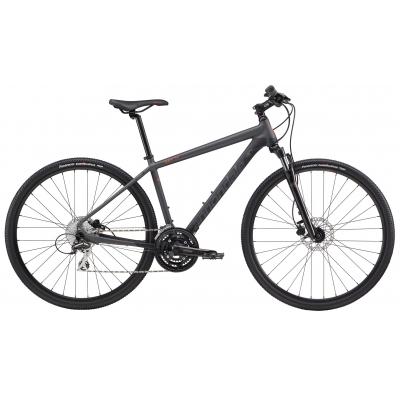 Buy your Cannondale Quick CX 4 All Terrain Hybrid Bike 2019 from Revel Outdoors.